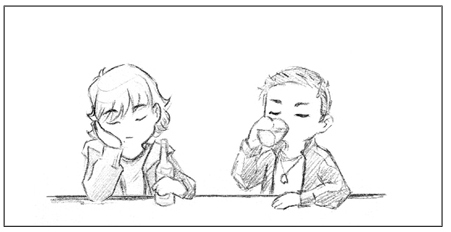 The Supernatural fandom has produced some wonderful comic commentary about the show through the talents of its artists. One such artist is Olga who produced chibi artwork and comic strips and has had her artwork housed at a LiveJournal community in her honor called The Dean Show. Olga has done comic strips that delve into the canon of the show, as well as the fanon. 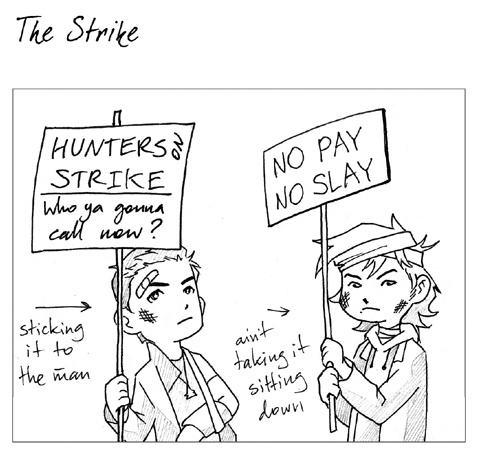 I’m particularly fond of her Weechesters art of the boys when they were young. 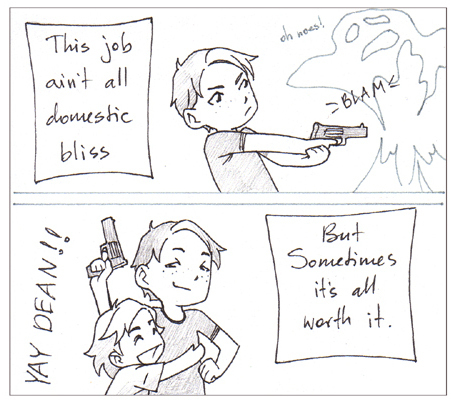 Growing up on the road was tough and Dean had to become both father and mother to his little brother, but he did a fine job of it. Whether it was making sure his brother got the last of the food while Dean went hungry or making sure no supernatural creatures harmed them, Dean always got the job done. Those in the fandom will attest that the last scene of Season One was very traumatic for us. Yes, all three Winchester lives hung in the balance and we didn’t know who was going to live, but did you see what they did to the car?! Poor Impala, she took a beating. But until we knew for sure that she would ride again, we mourned her possible loss. 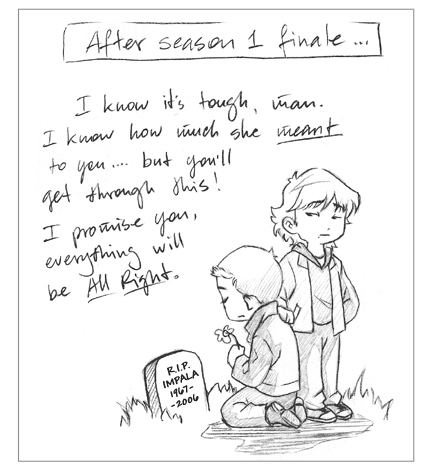 And remember the third season when it was all about Dean and his last year of life? He sold his soul so that Sammy could live and his time was ticking away. Whether they found a way for him to get out of the deal or not, Dean wasn’t going to let his last year alive go without hitting some milestones. Yeah, live life to the fullest, Dean Winchester. But also, he could use that to his advantage to guilt Sammy into doing his bidding. Playing dirty? Nope, he was just stating facts. While you’re checking out The Dean Show community, please look at the artwork titled “With Parting Sorrow,” aka the Madison piece. It’s so wrong and so right all the same time. I love it when artistic commentary can do that.